No 29 work this year has been confined to driver experience turns since the discovery of a loose tyre, upon the discovery of a second loose tyre No 29 was confined to the shed at Grosmont. No 29 has waited a number of weeks whilst engineering works on Sir Nigel Greasley allow the frames to be reunited with his wheels.This took place on 15 October. 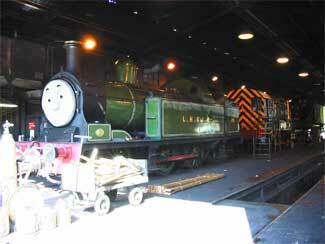 29 was steam cleaned on 14 October and moved under the sheer legs in the workshop . She will then be lifted on sheer legs to facilitate the removal of hers wheels. The wheels will be sent away to Ian Rileys workshops for the fitting of new tyres* whilst a full axle box and motion overhaul are carried out at Grosmont. *The North Yorkshire Moors Railway Trust have a two sets set of new tyres that were donated some time ago, this will save the trust considerable costs of having new ones manufactured. Saturday 13th September 2003. 29 "sits out" the Thomas event in the running shed whilst awaiting repair. 29 "sits out" the Thomas event in the running shed whilst awaiting repair.